This lease is designed for a short tenancy (one year) for an office suite, with the premises leased in an "as-is" condition to the tenant. 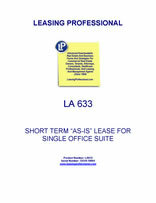 The form is appropriate for a short term lease of a single office suite in a multi-tenant building. 1. Demised Premises: Landlord leases to Tenant and Tenant rents from Landlord those certain premises described as Suite ____ consisting of approximately _____ square feet in the office building having a gross leasable area of approximately _______ square feet (hereinafter referred to as Office Building located at ___________________, said measurements being from center of partition to center of partition, except that in the event Demised Premises is an end suite, measurements shall include full width of end wall (hereinafter called the "Demised Premises"). The boundaries and location of the Demised Premises are outlined in a diagram of the Office Building, which is attached hereto and made a part hereof and marked "Exhibit A". Said Exhibit sets forth the general layout of the Office Building and shall not be deemed to be a warranty, representation or agreement on the part of Landlord that said Office Building will be exactly as indicated on said diagram. Landlord may increase, reduce or change the number, dimensions or locations of the walks, buildings and parking areas as Landlord shall deem proper, and reserves the right to make alterations or additions to, and to build additional suites on, the building in which the Demised Premises are contained and to add buildings adjoining same or elsewhere in the Office Building. The use and occupation by Tenant of the Demised Premises shall include the right to the non-exclusive use, in common with others, of all such automobile parking areas, driveways, truck and service courts, walks and other facilities designated for common use, as have been installed by Landlord, and of such other and further facilities as may be provided or designated from time to time by Landlord for common use, subject, however, to the terms and conditions of this Lease and to reasonable rules and regulations for the use thereof, as prescribed from time to time by Landlord. 1.01 ACCEPTANCE OF PREMISES. The Premises are hereby leased to Tenant subject to: (i) any and all laws, as applicable, now in force hereafter enacted; and (ii) any title matters of record or otherwise disclosed to Tenant. If construction of the Premises is completed as of the date this Lease is signed by the parties, Tenant certifies that it has inspected the Premises and, in reliance on such inspection, acknowledges and accepts the Premises and the Office Building, all of which Tenant confirms as being satisfactory. Tenant further acknowledges that the Premises, including all fixtures, equipment and furnishings contained therein, are in satisfactory or excellent condition and accepts the Premises in its "AS IS" condition, without requiring Landlord to make any repairs or replacements thereof. Tenant hereby waives any objection to and releases Landlord from any liability arising from the condition of the Premises from and after the date of Lease execution. 1.02. Landlord will, at its sole expense, perform all work specified to be performed by Landlord more specifically set forth in Exhibit "B" attached hereto and entitled "Landlord's Improvements". Tenant will, at its sole expense, perform all other work necessary to complete the premises for its business purposes including, without limitation, the work specified to be performed by Tenant more particularly described in Exhibit "C" attached hereto as "Tenant's Improvements"; provided however, all of Tenant's work shall be performed by licensed contractors acceptable to Landlord, in accordance with its final plans, specifications and drawings furnished to Landlord, which shall be in compliance with all laws, including applicable building and zoning codes. 2. Term: The term of this Lease shall be twelve (12) months and fifteen (15) days commencing on _________ ("Commencement Date") and ending _________ ("Expiration Date"). At the expiration of the term of the Lease, Tenant will vacate and surrender the Premises to Landlord in accordance with the terms hereof and said Premises shall be in broom clean condition. 4. Landlord acknowledges receipt of the first months rent in the amount of $____. 5. Covenant to pay. Tenant shall pay Rent to Landlord from the Commencement Date without prior demand, together with all applicable sales tax thereon as provided by law from time to time; for any Lease Year greater or less than twelve (12) months shall be prorated on the per diem basis, based upon the number of days elapsed over 365-day year. Tenant agrees that its covenant to pay Rent to Landlord is an independent covenant and that all such amounts are payable without counterclaim set-off, deductions, abate or reduction whatsoever, except as expressly provided for in this Lease. 6. Rent Past Due: Tenant agrees that if the rent has not been paid by the 5th of the month, there will be a $50.00 late charge. If rent has not been paid by the 10th of the month, there will be a late charge of $75.00 and if rent has not been paid by the end of the month the late charge shall be $175.00. Tenant agrees to pay the cost of collection and reasonable attorneys fees on any part of rental that is past due, plus interest not to exceed 8% per annum or the maximum legal interest rate, whichever sum is less. 7. No Abatement of Rent. Except as specifically provided to the contrary in this Lease, there shall be no abatement from or reduction of the Rent due, nor shall Tenant be entitled to damages, losses, costs or disbursements from Landlord during the Term caused by or on account of the fire, water or sprinkler systems or the partial or temporary failure or stoppage of any heating, cooling, lighting, plumbing or other services in or to the Premises or the Office Building, whether due to Force Majeure or the making of alterations, repairs, renewals, improvements or structural changes to the Premises, the Office Building, the equipment or systems supplying the services, or from any cause whatsoever, provided that the said failure or stoppage is remedied within a reasonable time.